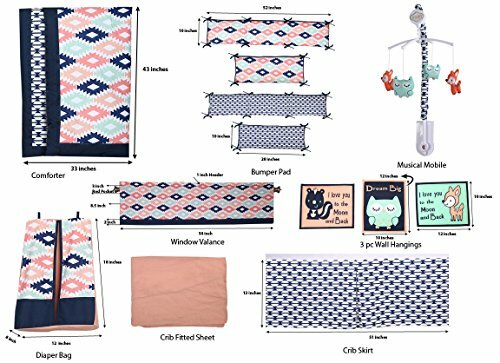 This six-piece crib bedding set includes one quilt, two fitted crib sheets, one crib skirt, one wearable blanket (recommended for safe sleep), and a set of wall decals to. complete your nursery decor. The neutral color palette makes it perfect for boys or girls. Babies, infants, and kids will love the safari animals including a lion, giraffe, elephant and zebra. 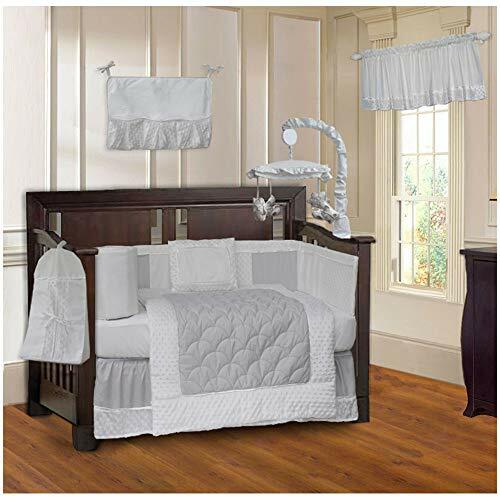 Dimensional trims along with soft furry fabrics and embroidered details add to this popular themed baby bedding set. 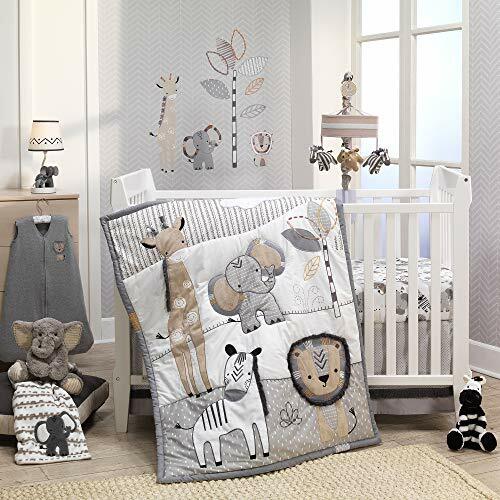 The 100% cotton, breathable fitted crib sheets include one tossed animal print and one solid gray. A dotted print with gray furry trim completes the decorative crib skirt. Included for safe sleep is a 100% cotton interlock wearable blanket with lion applique. Fits a size small – medium. Add a designer touch with these easy on easy off wall decals. Included is a happy giraffe, a sweet elephant, a courageous lion and a colorful tree. 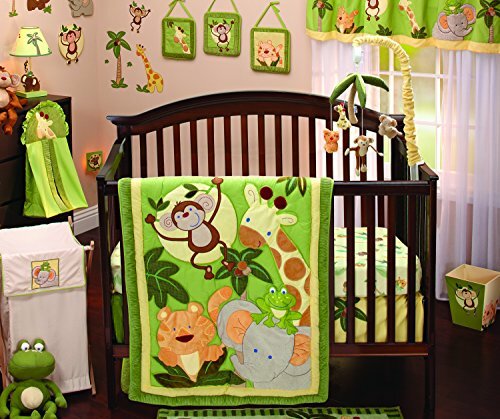 Finish your jungle safari nursery theme with additional accessories sold separately, such as the crib bumper, extra fitted sheet, baby blanket, plush elephant stuffed animal – Jett, musical baby crib mobile, and additional wall decals. 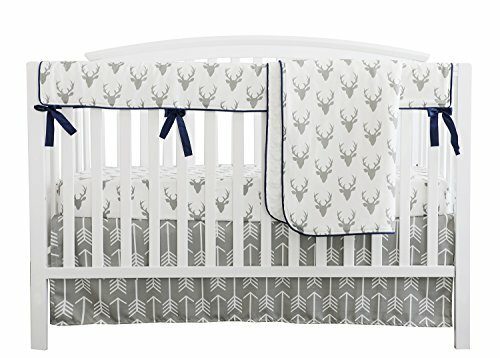 Gender neutral color palette of gray, beige and white makes this crib bedding set perfect for a little baby boy or girl. The quilt has dimensional trims on the lion, giraffe and zebra along with soft furry fabrics and embroidered details. 100% breathable cotton fitted crib sheets include one tossed animal print and one solid gray. 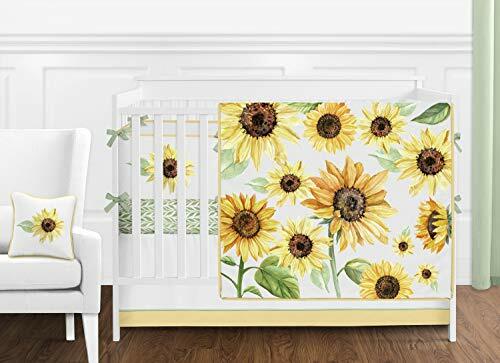 The sheets have elastic all around for a safe and secure fit on a standard crib/toddler mattress measuring 28″ x 52″. Included for safe sleep is a 100% cotton interlock wearable blanket with lion applique.